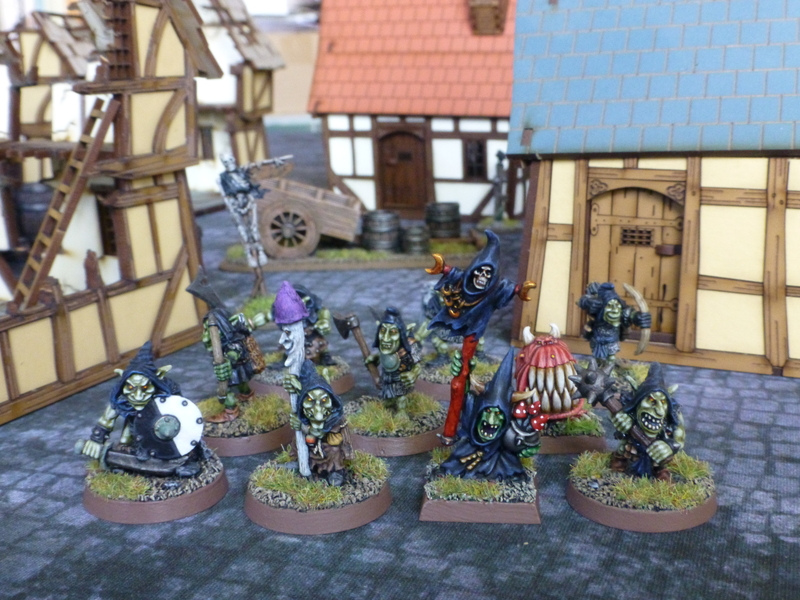 This entry was posted in Frostgrave, Warhammer and tagged Dwarfs, Frostgrave, Kev Adams, Knightmare Miniatures, Night Goblins, Oldhammer, Undead, Warhammer. Bookmark the permalink. Some great looking paint jobs! Thanks! Most of these miniatures haven’t seen battle since they were painted so it is a good opportunity. I like what you’re doing here. I’ve also got a copy of Frostgave that I’ve never used and a solid collection of WHFB-and-friends models. Please do keep us updated on how it all works out. It was the intention behind purchasing many of the lighter rules sets (mostly Osprey) to find alternative uses for the armies I already have. I’ll try and take some in-game photos and provide our impressions of the games as we delve into Frostgrave. Thanks, had a lot of fun with the first game, although my Undead got totally overrun by the Night Goblins! I’ll need to add some cheaper troop types to some of the gangs I have been contemplating. I did think that the dwarfs might struggle on that score… you need cheep bodies to cart off all that treasure! 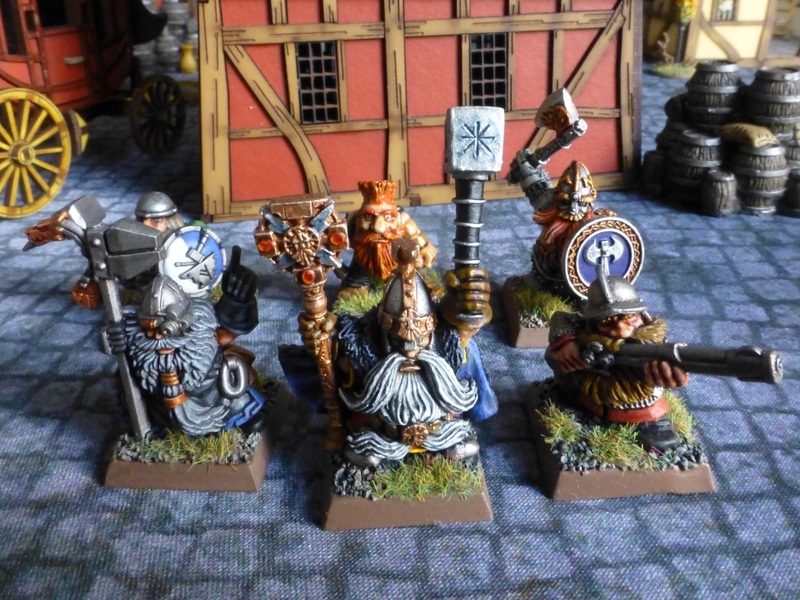 I did swap the marksman against two crossbowmen for the Dwarfs now, think I will use them in the next game. Oh this looks wonderful! 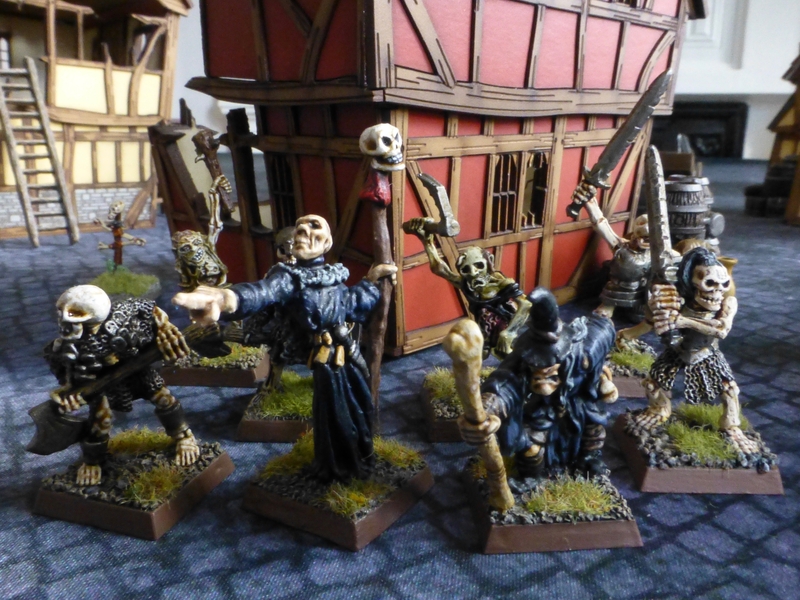 Love the Mordgrave approach — that is my preferred lens for Frostgrave as well! Thank you! I have been collecting the 4Ground buildings and other bits of terrain for a long while to put such a gaming table together. Rather than just a single city setting, I intend to carve out an area of the Old World around Ostermark where these clashes occur, so want to have wilderness settings too. 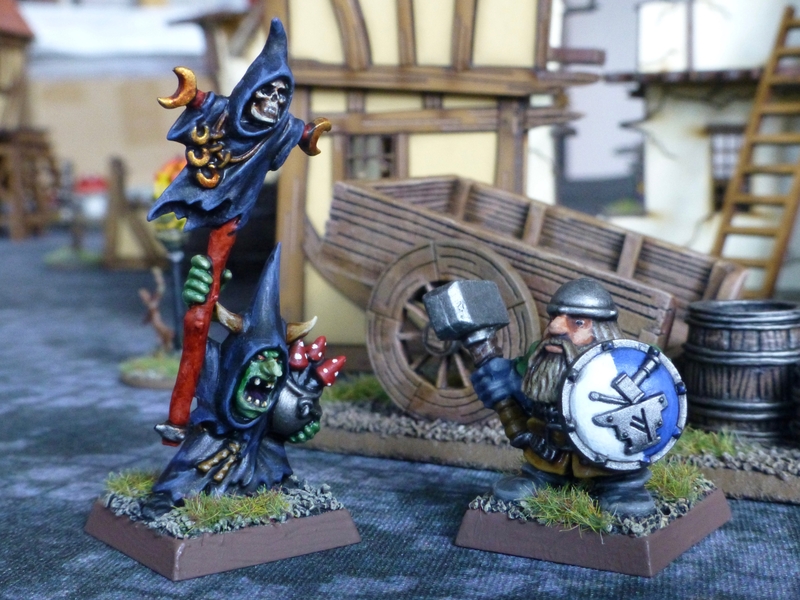 I love the goblin shaman and the dwarf is really crisp classic colours. I’m sure the wizard in your undead lineup came from a 3rd (maybe even 2nd?) ed. orc box: Mighty ugezods death commandos (I only know that as it was one of my first purchases). Total trip down memory lane. Cheers! Yes, that Necromancer is originally an Orc Shaman by Nick Lund. I bought that box set back in 3rd Edition days and never really knew what to do with the figure, until I started my Oldhammer Undead army and realised he really looks like a dark and morbid Gandalf. It was a blast (quite literally thanks to your bloody shamans!). I am glad to hear your luck persisted and you survived the final session of your D&D campaign. I reshuffled the Dwarfs and picked out some Dark Elves today to paint. Next up will be the Wood Elves after that! My plan to gradually buy & build 4Ground houses has come to fruition, mixed with some scatter terrain picked up over the years and the gothic ruins from Pegasus Hobbies. Got more of those to construct and just received my Mantic Terrain Crate Kickstarter, so I believe I am all set for skirmishing.